Start Earthquakes: How Frequent are They? If we look at earthquakes of any size all over the planet, we can see they are extremely frequent. Over 100,000 tremors are felt by humans each year in some part of the world –in other words, around 300 a day. But most are no more than simple tremors without any other effect. And if we factor in the ones that can only be recorded by our instruments –seismographs– but which are so small that no one can feel them, this figure rises to more than one million tremors recorded annually. It is estimated that several million earthquakes take place on Earth each year, but that most are not even detected by instruments as they occur in remote areas or have very low magnitudes. 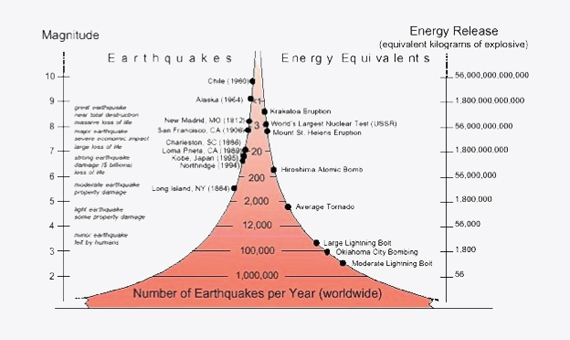 The following chart shows some statistics and the classification of earthquakes according to their size (in terms of the energy they release) and their number. It shows that earthquakes are an extremely frequent phenomenon. Number of earthquakes per year depending on their magnitude (Source: United States Geological Survey). Based on statistical observations made since 1900, every year there is one earthquake on the planet with a magnitude of more than 8; 15 with a magnitude of between 7 and 8; and 134 earthquakes with a magnitude of between 6 and 7. With the rise in the number of seismic stations installed in recent years, the number of earthquakes located has also increased. However, the rate of major earthquakes (with a magnitude of over 6) occurring every year has remained constant. However many people still ask whether the number of earthquakes occurring on Earth is rising: Chile (M8.3, September 2015); Nepal (M7.8 and 7.3, in April and May 2015); Taiwan (M6.4, February 2016); Indonesia (M7.8, March 2016); all catastrophic and widely reported in the media. The statistics have not varied, and there are no more major earthquakes today than in the past. But the giant strides in global communications have brought a significant change that may have influenced that perception. Today, news of these large seismic events and their devastating effects reach more people faster. 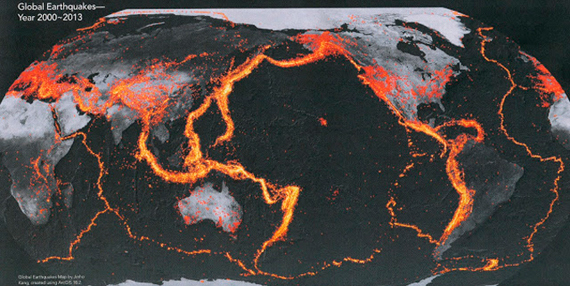 Today we can even track seismic activity in any corner of the planet almost in real time using social media. However, the world population continues to grow, and it also does so in seismically active areas. This is why even though the frequency of earthquakes has not varied, their social, political and economic impact has certainly increased.